The largest and the longest river in the western Nepal, Karnali is the destination for most of the rafters in Nepal. Also known as Ghaghara in India, Karnali literally means ‘holy water from the sacred mountain’. It is a paradise for the rafters and kayakers as it gives the most amazing experience to them. One passes through the dense forests and spectacularly beautiful landscapes while kayaking in the river and it is also safe for the big volume river rafters. 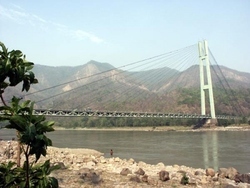 Also the Karnali Bridge is one of the most beautiful bridges of its kind in the world solely held with the support of cables on all sides. Except for the two pillars at the center, no other pillars exist. The river is purely a mountain river and flows through some of the least explored and remote areas of Nepal. It is also one of the premier fishing points in Nepal. From here, one can enjoy the majestic views of the Himalayas as well as get the best rafting and kayaking experiences. It is also considered as one of the finest stretches of white water in the world. The cool breeze blows throughout the day, stopping only for an hour or so during the day. 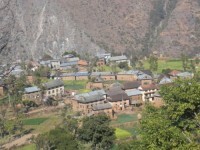 On the other side of the bridge is Chisapani, a small market place in the western Nepal. It is a haven for those who desire to experience breathtaking scenery, scintillating action and enjoyment of a long trip. Along with the flow of the river, the environment changes into the magnificent views of the Himalayas, beautiful beaches followed by dense forests. It is comparatively difficult and thrilling experience as the rapid changes along with the flow of the river and it is only suggested for expert rafters. The river also passes through the Bardia National Wildlife Reserve, one of the finest wildlife reserves in Nepal. One can enjoy plenty of adventurous activities like elephant safaris, canoeing among the marsh mugger crocodiles, jungle walks and bird watching in the park. Also, lodges and tented camps are available for the stay. If nothing else, one visit to Karnali is a must even if it is only to see and walk through the longest and widest and one of the most amazing bridges in Nepal.